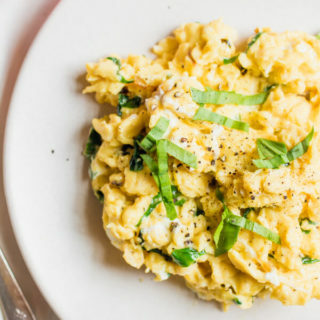 Buttery soft scrambled eggs with fresh spring wild ramps and tangy goat cheese. A simple, yet decadent, breakfast. Only four ingredients, 5 minutes from start to finish. Slice the white part of the ramps and set aside, roll the leafy green tops into a tight cigar shape and slice into thin ribbons. Set aside. Crack eggs into a bowl and whisk well to combine. Set aside. In a medium-sized saucepan over medium-low heat melt 1/2 the butter, add white part of ramps to the saucepan and cook for 2 minutes, add greens and cook, while stirring, for an additional minute. Season with a pinch of salt and pepper. Pour eggs into the saucepan with Ramps and using a spatula gently push the sides of the eggs into the center of the pan creating soft ribbons. Continue until eggs are almost well-formed. Remove from heat and add remaining butter, stirring gently into eggs. Also, start with equally good quality butter, I am a huge Kerrygold fan, or any pastured/ grass-fed butter will do. Whisk your eggs super well until you can no longer see the separation between yellow and white. There is no need to add any cream, milk, or water to your eggs. They are perfect as is. Pour your eggs into the melted butter and over medium-low heat using a spatula gently push the eggs into the center of the pan creating a ribbon-like shape. This should take a few minutes. As soon as the eggs appear to have just a bit longer to go I turn off the heat to not overcook them and continue stirring until finished. Julia Childs Tip! At this stage add an additional 1-2 tsp of butter to the pan and allow it to melt over your perfectly soft scrambled eggs.